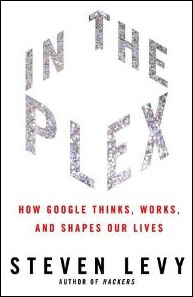 I just got done reading (listening to) In the Plex by Steven Levy. Google has become such a part of our every day lives, that we take its existence for granted. It's hard to believe that it was all the way back in 1996 that two Stanford University friends, Larry Page and Sergey Brin, began working on a better search engine using advanced algorithms. The book tells the story of this remarkable company in all its detail. In one chapter, Levy describes the culture of the company, originally summarized with the phrase "Don’t Be Evil." However, Google’s continuous push for technological innovation sometimes found mass resistance as the company launched such ambitious projects as putting the world’s books on Google and the Google Maps street view option. Other chapters in In the Plex detail the financial triumph of Google’s ads; the road to the IPO; and the troubles of Google in China, where it took on a local competitor and the government. Google continues to innovate. Next up, social media and Google+. Will be interesting to see how they do.